Are you prepared for life’s ‘what ifs’? What if you were disabled in an accident or due to an illness? Will your dependents have sufficient funds to meet their daily and future needs? Will you become a financial burden to your family or relatives? What if your career was suddenly interrupted by long-term injury or illness? How will you continue to accumulate sufficient capital to provide for retirement? In 2010 alone, Liberty paid R270.5 million in lump sum disability claims. You stand a 1 in 8 chance of suffering a disability before age 65. 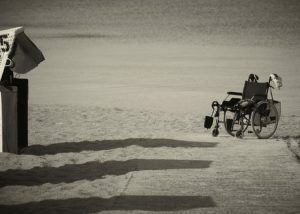 In South Africa, only 25 out of every 10 000 people who are disabled are rehabilitated and return to work. More homes are lost through disability than death. We cannot promise you protection from injuries or illnesses but we can offer you the solution to life’s ‘what ifs’ and help you deal with the loss of income as a consequence of disability or impairment. With our lump sum disability benefits, you get a cash payout that enables you to settle your debts immediately and make lifestyle adjustments to ease the effect of your disability. Absolute Protector gives you the best of both worlds by combining Capital Disability and Impairment under a single benefit, taking away the burden and uncertainty of having to choose which type of cover might be most appropriate for you. Absolute Impairment, like Impairment, covers the loss of function in any part of the body, whether it is physical, functional or mental. While Impairment provides you with a percentage of your cover amount depending on the level of impairment suffered, Absolute Impairment will pay out your full benefit amount, after which the benefit will cease. You may have an impairment that is not included in the list of specified conditions covered under the Impairment benefit and yet find that your condition is permanent and severe enough to prevent you from performing your daily activities such as washing, dressing and feeding yourself. That is what the purpose of the Activities of Daily Living (ADL) Catch All benefit category is – to provide you with additional security that your claim will be paid regardless of whether or not your impairment meets the specified medical criteria in another benefit category. With the Activities of Daily Living (ADL) Catch All, you have protection against conditions known and unknown, as long as the impairment has a severe enough impact on your ability to lead a normal life. An industry first! We have introduced new unique Whole of Life cover on our Lump Sum disability benefits*. If you have selected the Whole of Life cover, your benefit protects you against the risk of losing your income due to disability or impairment before you reach retirement age. After retirement, the lump sum disability benefits transform to protect you against a different risk – the risk that you become weaker and more vulnerable to illnesses and injuries as you age and lose your ability to function independently. This could lead to significant additional expenses which could erode your retirement savings. To protect you against this risk, our Whole of Life lump sum disability benefits provide you with a monthly income which is payable for the rest of your life should you suffer an impairment after retirement. The monthly claim amount you will receive will be calculated as a percentage of the insured amount and will depend on how severe your impairment is. Furthermore, to protect the value of your monthly benefit over time, the monthly claim amount will increase annually with inflation. Sixty-five is no longer the expected retirement age. People nowadays retire much later. Some purely because they love what they do, others because they do not have enough funds to retire. Whatever your reasons, we recognise the need for you to choose when you want to retire, and that is why we now offer you lump sum disability benefits that end at age 65 or age 70 next birthday. People are not only working longer, they are living longer too. The new Whole of Life benefit term option is an ideal way to help ensure that you protect yourself for the rest of your life. The Lifestyle Protector Solution – helping our customers manage life’s ‘what ifs’ better, for longer!